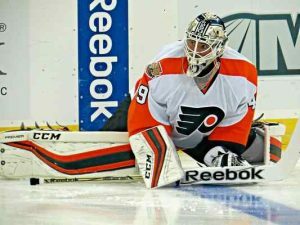 What Should the Philadelphia Flyers Do In Goal? 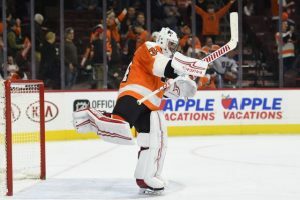 Following an 8-5 loss on home ice to lose their first-round playoff series against the reigning back-to-back Stanley Cup champion Pittsburgh Penguins, one thing about the Philadelphia Flyers became glaringly apparent: their goaltending situation is uncertain, and ultimately, unsolved. 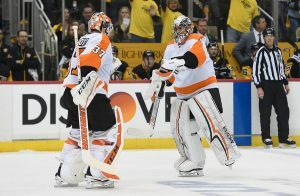 For years, now, the Flyers have yet to find a steady goalie tandem, and following a 6-game series of blowout after blowout, they have some work to do in the offseason if they want to fix their problems in goal. In 2017-18, the Philadelphia Flyers had a multitude of goaltenders appear in net during the regular season– four, to be exact. The offseason acquisition of longtime St. Louis Blues starter Brian Elliott was supposed to shore up their troubles in net, but due to inconsistent play and a prolonged bout with injuries, Elliott didn’t quell any uncertainty. Michal Neuvirth, who has been with the Flyers for a number of years, served as Elliott’s backup and interim starter while he was out. 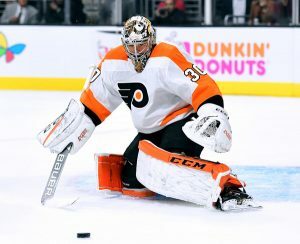 He, too, dealt with injury, making way for the young Alex Lyon to start a number of games, and ultimately forcing General Manager Ron Hextall to trade for goalie Petr Mrazek from the Detroit Red Wings at the deadline. All in all, the Flyers were all over the place this year with respect to goalies. Here’s how every goalie fared this year: Brian Elliott, the expected starter, had 43 GP with 42 GS, posting a 23-11-7 record with a 2.66 GAA and .909 SV%, along with 1 shutout. For a pretty stable veteran goalie who has put up better numbers in the past, this performance is a bit subpar. All things considered with his injuries, however, and potentially a couple good years left in the tank, Elliott could be given the pass on this year and looked to to start again this upcoming fall. As for Elliott’s counterpart, Michal Neuvirth, he had 22 GP with 18 GS for a 9-7-3 record, with a 2.60 GAA and .915 SV%, as well as a shutout. When both Elliott and Neuvirth went down, the rookie Alex Lyon stepped in and finished the season with 11 GP, 7 GS, a 4-2-1 record, and a 2.75 GAA with a .905 SV%. Lastly, the trade deadline acquisition from Detroit, Petr Mrazek, disappointed on all counts. Since putting on a Flyers sweater, Mrazek had 17 GP with 15 GS, a 6-6-3 record, and a 3.22 GAA and .891 SV%, with a single shutout. What’s interesting to note is that every one of the four goaltenders has less GS than GP, which means each of them were pulled mid-game on more than one occasion. That’s an ugly fact about just how bad their goaltending situation was this season. Every one of the Flyers goalies performed either average or below average this season. And the problem was this: it didn’t get better come playoff time. The Flyers had three different goalies appear in just 6 playoff games this year (Elliott, Neuvirth, Mrazek), and none of them were able to effectively hold off the Pittsburgh Penguins, albeit they have one of the most potent offenses in the league. In 4 GP and 3 GS in this year’s playoffs, Brian Elliott went 1-3, with an atrocious 4.75 GAA and .856 SV%. Not much better at all, Michal Neuvirth went 1-1 in 3 GP and 2 GS, with a 4.40 GAA and .847 SV%. Lastly, Petr Mrazek appeared in just one game with 31 minutes TOI, and a 3.87 GAA and .857 SV%. The fact that Philadelphia was able to take the Pens to 6 games in the series is something to marvel over; however, it goes to show that despite how many goals you score, you’re not going to win games without keeping the puck out of your own net. This is something the Flyers have been proving time and again for a while. So, the question presents itself to Philly’s management: What should they do in goal? 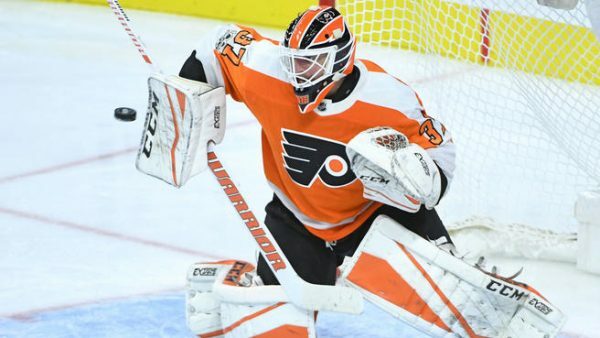 On the one hand, GM Ron Hextall might have a case to stay with Brian Elliott for another year and hope he is healthy and plays the way they expect him to, while having either Neuvirth or Mrazek back him up and shipping away or sending down the odd man out. On the other hand, Hextall could also use this opportunity to make a really gutsy move and look elsewhere on the goalie market for someone who could potentially step in and take over. Whether it’s a little healthy competition or a complete replacement, that is also an option– perhaps one that would pay off longterm. Maybe they take a shot on someone with something to prove, say Robin Lehner, who looks to be ousted from the Buffalo Sabres this offseason. Whatever Hextall and the Philadelphia Flyers decide to do, they are certainly doing so with the aim of solidifying a clear-cut number one and number two, both of whom consistently give their team a chance to win. What they need to do might involve taking some action and rolling the dice on someone else while getting a decent return for what they have now, but ultimately it remains to be seen what direction they want to take.